Request 1 or more size here. 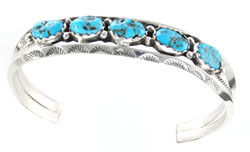 Navajo made, sterling silver, five free form turquoise stone bracelet with stamped triangle wire borders. Measures approximately 5/8"W. This is a "mens" size bracelet. Wrist size 6" ,6 1/2", 6 3/4" and sometimes 7" with a 1 1/2" opening. Request by size or "medium" or "large" size when ordering. Stones will vary in shape and size. Made by Harry Spencer.